Miguel Cruz Tejada of Primicias Digital reports that on Friday March 21, at the Schomburg Center for Research in Black Culture located in Harlem, local poets and writers will have a panel discussion themed ‘Forging a Common Path: An Anthology of Afro-Caribbean and Brazilian Poetry, Culture and Thought.’ The discussion celebrates the literary legacy of poet, writer and researcher Manuel del Cabral (Dominican Republic, 1907-1999). Del Cabral was one of the greatest exponents of Afro-Caribbean poetry in Latin America; his body of work explored the meaning of Afro-Caribbean identity. The panel will discuss how writers in Latin America and the Caribbean (may) forge a common path across different spaces to reclaim their African heritage. 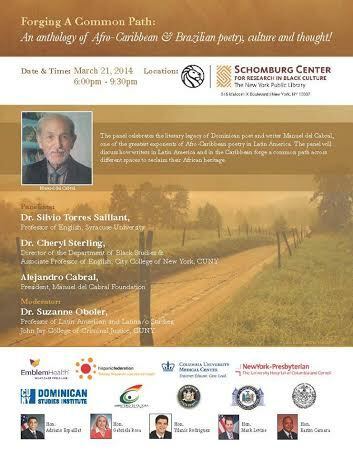 In the panel will participate: Dr. Silvio Torres-Saillant, professor of English at Syracuse University, Dr. Cheryl Sterling, director of the Black Studies Department and associate professor of English at the City College of New York (CCNY), Alejandro Cabral, President of the Manuel del Cabral Foundation, and Dr. Suzanne Oboler, professor of Latin American and Latina/o Studies at the John Jay College of Criminal Justice in Manhattan. The panel’s host will be Rev. 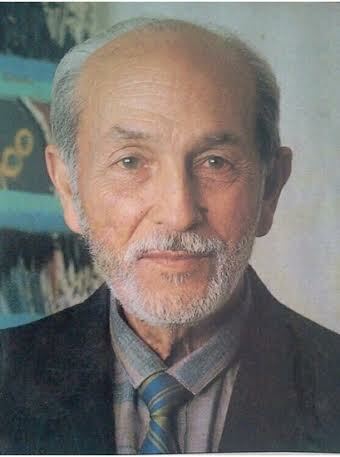 Karim Camara. The full, original article (in Spanish) is at http://www.primicias.com.do/index.php/diaspora/noticias/new-york/3797-poetas-y-escritores-celebraran-en-ny-un-panel-sobre-la-obra-de-manuel-del-cabral.